Aimee Fox specialises in Education and Family Law. Please click on the links below to view her specialist profiles. 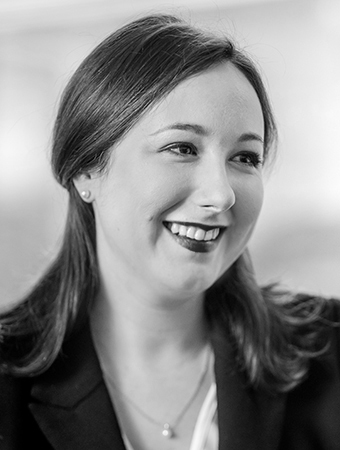 Before joining the Bar, Aimee was an Associate in Clifford Chance, Brussels where she specialised in European Competition Law. Aimee was involved in a number of high profile cases of a contentious and non-contentious nature, this included the merger of the world’s largest pharmaceutical company, Pfizer Ltd with Wyeth Ltd.
During her time in Brussels, Aimee also spent time working in the European Commission where she was a member of the team which worked on the approval by the European Commission of the merger between Orange and T-Mobile to create the EE mobile network. Aimee has delivered lectures at conferences and seminars on a range of topics. She has also trained a number of local authorities in the field of education law. Aimee has accepted public access instructions since 2015. Aimee has a busy education law practice and regularly appears in the First-tier Tribunal. She acts for and advises all parties including, local authorities, schools, parents and young people. Aimee was recently invited to speak on education law at the National Conference of Chartered Paediatric Therapists 2018. Aimee has also been instructed on a number of judicial review matters. She was successful in defending a local authority in a claim for judicial review brought pursuant to section 19(1) Education Act 1996. This case concerned an appeal from the First Tier Tribunal. The Appellants argued that the Tribunal had misdirected itself on the law in respect of issuing an Education, Health and Care Plan and the ability of a mainstream school to make relevant provision. This case involved issues which Aimee’s opponent, David Wolfe QC, described to Upper Tribunal Judge Jacobs at the oral hearing as “complex and novel”. For more information click here. Aimee Fox successfully represented the local authority against an allegation that there had been a failure by it to provide suitable education for DS in breach of its duty under section 19(1) of the Education Act 1996. DS had not returned to school after a contested incident during which he had returned home in a state of undress. Mr Justice Garnham went on to consider whether, if a breach had been found, the local authority’s alternative provision would have been suitable. For more information click here, for the Baillii report click here and for the Local Government Lawyer article click here. Aimee regularly appears at all stages of private law disputes. She represents parents, children and grandparents. Aimee has a thriving practice in family finance law which allows her to advise on the interplay between marital or cohabitation breakdown and arrangements for children. Aimee is regularly instructed in complex proceedings involving children which include allegations of physical and emotional abuse, domestic violence and parental alienation. Aimee is well equipped to handle applications where there has been social work involvement after spending a number of years representing parties in public law care proceedings. Aimee’s expertise in education law allows her to excel in applications involving children with special educational needs, mental health diagnoses or disability. This allows her to provide advice on applications involving schooling. Aimee is experienced in representing parties involved in disputes where there is expert evidence. In her areas of practice, she has cross-examined psychologists including educational psychologists, psychiatrists, occupational therapists, speech and language therapists, physiotherapists as well as teachers. She has experience of internal and international relocation cases and has provided training to solicitors on pursuing and defending relocation applications. Aimee has an LLM in European Law which makes her particularly adept in this area. Aimee has been commended for her personable manner and client focused approach. She always seeks to find pragmatic and cost-effective solutions for her clients. Aimee has a wide variety of experience in family finance and cohabitation disputes. She has an established practice in proceedings under the Matrimonial Causes Act 1973, the Civil Partnership Act 2004 and the Trusts of Land and Appointment of Trustees Act 1996. Aimee is often instructed to represent parties where there are elements of inherited wealth or pre- or post-relationship acquired assets. Aimee has been involved with a number of more complex matters including cases involving the Proceeds of Crime Act 2002 and personal injury. She has also been able to call upon her expertise in the law of special educational needs to assist in advising separating spouses whose children require bespoke accommodation or additional care. Recent cases Aimee has been instructed on include representing the applicant in a civil partnership dispute worth several million pounds with assets including 12 properties and a very high value share portfolio. Aimee is happy to advise in conference or provide written advice. Aimee is available to provide bespoke training. This was one of the first cases, under the Children and Families Act 2014, in which a local authority’s Local Offer was under challenge. In judicial review, it was alleged that the Local Offer was unlawful for a number of reasons including the failure to offer Applied Behavioural Analysis (“ABA”) to children with Autism Spectrum Disorder. This judicial involved the cross over in jurisdiction between children’s social care in respect of the local authority’s duty to accommodate a child under section 20 of the Children Act 1989 and the Children and Families Act 2014. Aimee defended the local authority and permission was refused on the papers. Aimee Fox is qualified to accept instructions directly from members of the public and professional clients under the Direct Public Access scheme.